OK, embedding of this Xiphactinus is done, assembly is done, now all that is ahead of us are hours upon hours of detailing. That and figuring out exactly how it's getting upright. That will be an interesting day... I don't think I want to take video of that. On the bright side not only is the project almost done, but to preserve our sanity Jacob and I have been able to devote one hour at the end of each day to preparing other stuff. Special treat for follower Saurian, Jacob has been preparing a cervical vertebra from our BCT specimen of Daspletosaurus n. sp., out of the lower Judith River Fm. I on the other hand have a special secret non-dinosaur project, that I hope I'll be able to reveal in the first quarter of the new year. It's very exciting, trust me! Below is a new photo of the progress made in the past week. Exciting, no? Well, assembly is pretty much finished! Leroy is embedded and now all that lies ahead are weeks and weeks of detail work. And of course the whole how the heck are we going to get that slab upright. It's ok, I have a plan, sort of. If it doesn't work you will all know about it in a few weeks. The mount right now weighs in at about 1200 pounds. Jacob is pointing to the specimen for scale. It's hard to get it all in one shot, with the overall size of 16'x7'. We need to start finding smaller fish. As some of you may know, we are currently working on the construction of a plaque mounted Xiphactinus, nicknamed "Leroy", that was collected in the mid 1990s. "Leroy" is a big Xiphactinus at 15 feet, however not quite as large as "Mildred", the 18 foot long monster that we collected in the summer of 2008. Making a plaque mount is a very time and labor intensive process, espescially when the bones are jumbled when in the ground. Each individual element must be removed and prepared, and of course prepared on the correct side. The right side of the skull was the best and prepared side, which drove our decision to have the right side of the entire fish displayed. I'll post photos of or progress as we move forward. This is what the project looked like nearly a month ago when the major preparation was finished, and we decided to start laying out the fossil bones. Curator doing the classic TPI field pose (pointing "There it is") for scale. The size of the project is deceiving, the black rectangle is a 16 by 5 foot area of steel and 3/4" plywood. The chicken wire mesh is for strength of the material used to embed the bones. You can probably see that there are literally hundreds of individual bones (spines, fins and ribs)missing. The simple reason is that in this early stage, we don't want too much stuff floating around. You will see these elements get put in later stages of the process. We were filmed for a Voice of America feature a while back, and now it is online. Judging by the length of my hair I'd assume it was during field season. Fossil of the week: revived! I've been slacking, I admit it. Here's the challenge of the week: The photo below is definitely a squamosal off of a chasmosaurine ceratopsian. The question is which one? Pleas guess int he comments section. Our new specimen of Pentanogmius evolutus, RMDRC 09-015, is now on display in the marine hall. This specimen was collected from the lower Niobrara chalk in Lane Co, Kansas earlier this year. Missing only the tail, this is one of the most complete and one of the few articulated specimens ever found of this uncommon fish. It's deep body and giant sail make it over 3 feet tall, with a total length of 5-6 feet. Pentanogmius was shown in the National Geographic IMAX film Sea Monsters, along with our Dolichorhynchops and Xiphactinus specimens also on display in the marine hall. As always, our exhibits are constantly changing, so come by this holiday season and see what else we're working on. The Niobrara sea was home to more than just Xiphactinus and sharks. There are dozens of other species of fish, some known very well, others from scrappy remains. One of the rarest is the fish formerly known as Bananogmius, now Pentanogmius. The name change is sad, really, because I quite enjoy saying "Bananogmius", although not quite as much as I love getting other people to try saying it. It was a large fish with no big teeth, yet a large sail fin running the length of the animal. 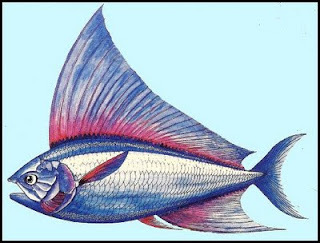 It had only tiny pectoral and pelvic fins. The RMDRC has a new articulated specimen (photo above) recovered this year off of private land. 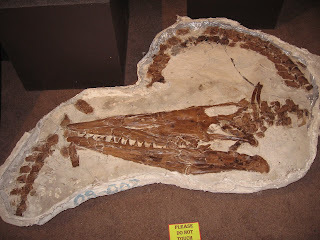 The skull is to the left, with the sail fin taking most of the upper half of the large jacket. This one is much larger (over 5 feet long), more complete, and better preserved than the new Denver specimen. It has been "show prepped" to a plaque stage, and will be molded as is. This will get the fish ready for 3d reconstruction using casts of the original bones. Nice specimens of Xiphactinus audax can be found occasionally in the Niobrara chalk, however articulated fish are extraordinarily rare. Unfortunately a jumbled pile of bones is not very pretty, so this month we are attempting to reconstruct a 15 foot fish as a panel (flat) mounted skeleton. Above is the skull of the fish, nicknamed "Leroy". It is currently partially prepared and has been on display in our marine hall since the museum opened over 5 years ago. The body was collected sometime in the mid 1990s. Below you can see Jacob Jett preparing one of the many jacketed slabs of bone and chalk. Trust me, that's really his hand. I'll continue to update as we proceed, however progress is slow due to how delicate fish bones are, even on these giant predators. Stop by and watch us work in the lab, we will be at this for a while! New Turtle Display Almost Done! I just wanted everyone to know our new surrogate marine hall is about finished and ready to open, hopefully for this (cold) weekend. We've got quite a turtle-heavy display, featuring skeletons of Archelon, Protostega, Toxochelys, Prionochelys and the shell of Bothremys. Also on display is a mosasaur-bitten Toxochelys shell, RMDRC 08-003 "Kraigums" that I discovered last spring, as well as the only real bones of Megalocoelacanthus dobiei on public display anywhere, the youngest fossil coelacanth found. There are also many more marine touch stations too. Please stop by and let us know what you think! 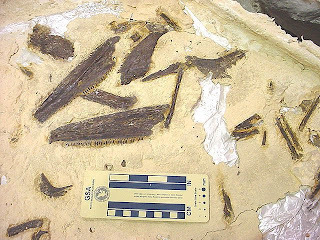 The Pteranodon sternbergi specimen (RMDRC 09-007) I discovered this spring was about 70% complete. The restored elements (mostly parts of the left wing and the lower jaw) are casts of CMNFV 41358, AKA "The Triebold Specimen". It is embedded in an artificial matrix simply because squashed flat bones are not useful for 3d specimen mounts. I am so happy this project is finally finished. Well, we've finally made time. Our Lambeosaurus, Joyce (RMDRC 07-020) is being prepared, partly because the dang main jacket (map above) is taking up way too much space in the prep area of the lab. The problem is that the bones are very difficult to separate. They are jackstrawed together, brittle, and now that all of the water has evaporated out of the jacket, the matrix is much harder. The site with Kraig and Jacob while exposed for NBC camera crew. Below is the main block before jacketing. Getting this apart is our newest challenge. Ok, let's see if this crazy thing works! During the summer, we spend a heck of a lot of time in our trucks. Since they're used off road in some pretty rough conditions, we try not to take anything new out there. It sure won't be new when it gets back. You get to know their quirks, and they seem to take on a personality of their own. Here is my favorite: Dumpy the Suburban. Our oldest vehicle, this wonderful piece of 1991 technology is surprisingly one of the more durable and dependable field trucks we own, even with 220,500 miles on it. Deer kill markings on the drivers side are a tribute to the hazards of remote country roads at night. Dumpy has taken me all over the west over the past 5 years, yet never left us stuck or stranded. It's received scratches on the hood from angry locals, blown out tires and has tried to crush somebody. The huge dent on the door is from a deer at 65mph. Don't ask how it managed to hit the side. Dumpy needs encouragement going uphill, usually sung to the tune of Aqua's "Barbie Girl". It moans on start up and smokes a little. Then again so do most of our field crew members at one time or another. But luckily, it has seemed to survive the cash for clunkers program (or as we like to call it, the Dumpycaust) unlike many of its cousins. If you see it rolling slowly around, make sure there is a driver in it, and wave. I will miss it when it is gone. A jacket of WXT, a huge Edmontosaurus specimen discovered in southern North Dakota 2002, was brought into the lab for preparation this past week. Before I could even begin, I noticed the scale pattern of the skin preserved as a film on one bone. 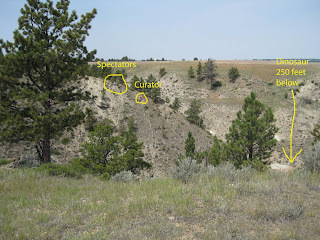 Skin is uncommon but not unheard of in the Hell Creek Formation. Further poking around showed scales preserved in the sandstone matrix in 3 dimensions. The scales themselves are only a few millimeters thick, and are preserved in a layer that will not separate easily. I'm now determining the extent of the skin present, and what should be done to it to best preserve it. The photo below shows one of the counterparts of the skin impression that was removed from the block. So, you wanna dig dinosaurs? 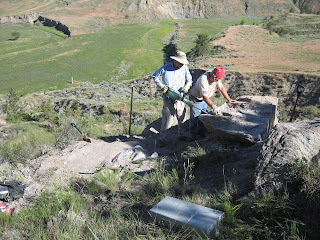 We're looking for a few volunteers to come with us to central Montana this summer to help scout, recover the rest of our giant Basilemys turtle and begin excavation on a big hardosaur (the tibia is over 4 feet long). Our crew will be leaving from Colorado on July 28th, and will likely stay for 2 weeks. We will be headquartered out of a camping lodge, and there is no cost to volunteers besides transportation and food. All excavation equipment and supplies will be provided, personal tools are to be brought by each person attending. More on that after applications are reviewed. Applications may be sent to me at anthony@rmdrc.com and should outline biology or geology experience. This trip is a wonderful way to gain experience for undergrad and graduate students in field collection methods. We will be focusing not only on excavation techniques, but data collection (mapping, stratigraphic sections and correlation, taphonomy) as well as site evaluation. This past week I was attending the 8th Conference on Fossil Resources in St. George, UT. The second group of talks all focused on the Campanian aged flora and fauna of the western interior. A few brief mentions of the poor neglected duckbill dinosaur fauna were made, but I wanted to share with you an image of one that I'd love to find: "The duckbill that ate Manhattan!" Paleo Tech Jacob Jett (6'4" tall, shown back in his younger days) is shown for scale. This isolated rib bone was discovered in the upper Judith River Formation (Campanian aged) in the summer of 2004 while excavating a centrosaurine horned dinosaur called "UTC". Isolated duckbill skeletal remains are not uncommon at dig sites. 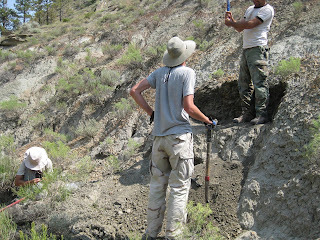 In fact, juvenile hadrosaur jaws have been found at both our "Joyce" and "Pete 3" sites in the same area. Unfortunately, isolated postcranial remains on hadrosaurs aren't very diagnostic, so it is impossible to say which critter this rib belongs to. It is a good deal longer than our longest rib on "Big Ed", the 34 foot long Edmontosaurus annectens that is now on display in Korea. I'd estimate the body length of this duckbill to be at least 40 feet. In honor of this week's late update, I present to you "Holly" RMDRC 09-007, a pterosaur from the lower Niobrara Chalk of western Kansas. It's only fitting, since the excavation of this specimen is the reason this week's update was so late. confirmation of the genus waits on further prep work, though we have a pretty good idea what it is. I discovered this specimen Monday morning while scouting on a private ranch. Excavation took about a day, and the entire specimen (including the rarely preserved skull) is back in our lab now. The blocks contain most of the body and wings as well as the rear portion of the lower jaws. Preparation will commence as soon as I get back from a small spurt of paleo conferences over the next few weeks. Pterosaur remains are not uncommon in the Niobrara, even though our dig sites are several hundred miles away from the nearest shore. Pterosaurs were strong flyers, and appeared to spend quite a lot of time hunting over the open ocean. The males had elaborate crests, most likely to attract females, just like their very distant cousins today! For this week's dinosaur, we venture up to Montana and the Judith River Formation, 75 million years ago in the late Cretaceous. Larry, a rancher who loves to hunt for dinosaurs near his home, was exploring badlands with Dr. Kraig Derstler during the summer of 2007. He had just finished wagering Kraig the princely sum of 2 quarters that he could find a diggable dinosaur fossil first when he came across hadrosaur bone fragments weathering out of a very steep slope. A bit of excavation revealed a few bones clustered together, luckily a RMDRC field crew was already en route to Montana, and we would spend the next month at the site. 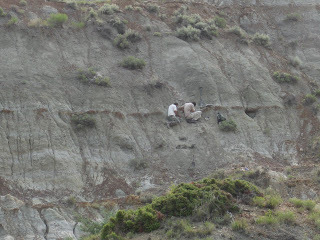 In the photo, Dr. Kraig Derstler and Paleo Tech Jacob Jett work on breaking up a large sandstone block above the dinosaur (under the white cloth near their feet). Small man-portable jackhammers help tremendously with digs like this. Most of Joyce (Named after Larry's wife, whoever finds the dinosaur gets to name it) was buried fairly quickly, with only a few shed tyrannosaur teeth in the quarry indicating limited scavenging activity. Unfortunately, not long after Joyce was buried, a small creek had cut through the site removing most of the tail. Somehow knowing it had been missing for 75 million years made us feel a bit better. From the limbs, vertebrae and skull were were able to tell that it was a lambeosaurine duckbill dinosaur, one of the types with a head crest. The pile of bones was so extensive that we had to remove most of it in one large jacket, and slide it up nearly 50 feet of slope to load on a trailer. Preparation is ongoing, and we hope to have some bones on display in the coming months. Joyce made her television debut in 2007 as well, with NBC Nightly News and ABC (Australia) both having camera crews visit us at the dig site. The video of our 2007 field season is up and on Youtube. Enjoy! Our field crew had just left an area called "The Forbidden zone" because our owner, Mike Triebold, had decided we had found too many specimens in that small spot. This sometimes happens in the Niobrara. We instead headed to the nearest outcrops, about 200 yards to the east. While still 25 yards away, Mike tossed his pick to the ground and exclaimed "Oh no, not another mosasaur!" As we approached closer we could see the sides of 6-8 dorsal vertebrae exposed on the outcrop surface. Back in the lab we prepared the specimen and remarked at the articulated ribs, as well as probable cartilage in between the ischia (pelvic bones). Ono is a very strange case, as headless articulated torsos are nearly unheard of in the chalk. This mystery made us do some "digging" ont he internet, and we discovered that we were working not far from Cope's 1871 expedition camp site. There is a possibility that the missing skull may have been collected 130 years prior! Back on the dinosaur side of things, we're working on a very large Triceratops skull. This unnamed skull was discovered in 1999 by Mike Triebold in Harding County, SD, and has been taking up a lot of room in storage ever since. We opened the jacket at the end of March and have been working at it in small increments ever since. There is a large area of ironstone concretion on this, the down side, making preparation difficult and time consuming. Once cleaned and stabilized, we'll rotate the jacket upright and work on the other side, hoping to have a 3d skull mounted in a few months. As you can see, it is missing its beak, lower jaws and a portion of frill. These items will be restored later with plastic and epoxy putty. The interesting things about this skull is the morphology preserved. It has a relatively large nasal horn, yet short and fat browhorns. There is a high degree of variation known in Triceratops, primarily because there are more skulls known than skeletons. In fact, Triceratops skulls are among the most common dinosaur fossils discovered in the Hell Creek Formation. This is the exact opposite of how we find other dinosaurs. Preparation is going strong on some of the larger jackets, which has the added benefit of freeing up space in the lab for other things! Here's the left ilium, with a total length of 1115mm. The bone is still very soft and fragmented. The only really well preserved parts tend to be the toes and legs. The object to the top of the jacket is a cervical vertebra, which we will separate from the ilium once this side is prepared and we can rejacket and roll the bones. Then it will be restoration (primarily crack filling) and molding time, which can be very challenging. These larger jackets are chock full of surprises. Due to the softness of the matrix and bone we were not able to fully excavate or identify the individual elements in the blocks. Now in the lab we are finding that this dinosaur is much more complete than we originally believed. 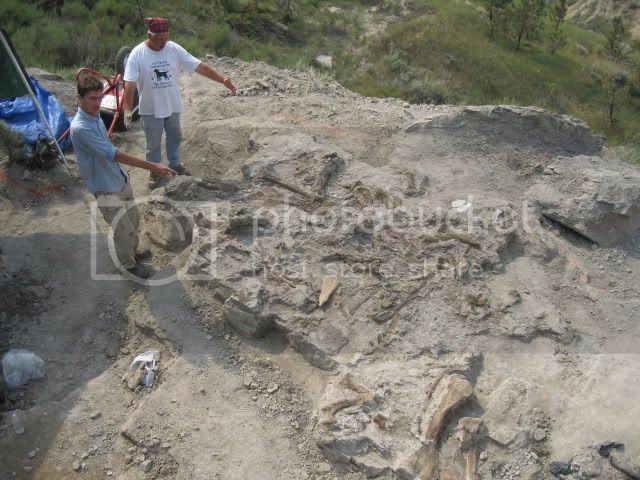 For our inaugural installment I present to you RMDRC 08-002, a Tylosaurus nepaeolicus specimen that was discovered in May of 2008 by John Bennitt in Gove County, KS. Lower jaw length is 757mm, for those of you keeping score. This was found on a private ranch where our company has been scouting for nearly 25 years. Because the Niobrara Chalk erodes so readily, the entire outcrop must be scouted every 2-5 years. In fact, this specimen was discovered less than 100 feet from a tiny Clidastes skull that I found 2 seasons prior. Since this is an articulated specimen, not much else will be done to it. Taking it apart for a 3-D mount risks too much damage to the skull, and articulated chalk specimens tend to have a lot of distortion from being smashed flat. In any case, there are plenty of cool things about this critter that re already shown. If you look closely at the neural spines of the anterior dorsal vertebrae, you'll notice a nice arc of missing bone. Click on the image for a larger view if jacket 1 of 3. This is a bite mark attributed to the shark Cretoxyrhina mantelli, whose shed teeth were also found lodged in Tracie. There appears to be a little preserved skin in both the left dorsal and lateral temporal openings, and the sclerotic ring of the eye is still in place. 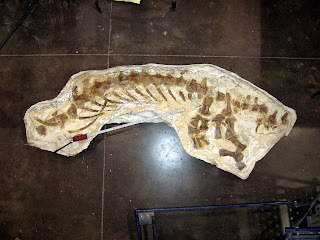 The cervical, dorsal and pygal vertebral series are complete, however the limbs and much of the tail appear to have been forcibly removed from the animal, hopefully after it died. This specimen is currently off exhibit due to Darwin and Dinosaurs, however it will return on display in July. I can't give too much of the exhibit away. It would cheat everyone that is making the trek up to Woodland Park for our lecture and grand unveiling. However, to show you the depth of the coverage of Darwin, we have a specimen of the type of bug that bit him on his voyage on the Beagle. We are expecting snow overnight and tomorrow morning, so please check with the RMDRC website after 4pm to make sure things are still happening as scheduled. If not, there will be an alternate date decided and posted then, however it looks like the storm will blow through early enough to allow the roads (and our parking lot) to be cleared in plenty of time. "These Darwin materials are part of a private collection and have never been on public display before. The collection is valued at well over $1,000,000. The exhibit will include original Darwin letters, books, maps, and artifacts. A scale model of “The Beagle” will also be on display. The exhibit will run through July 5." Welcome to the RMDRC's paleo lab blog. We're a working preparation, molding, casting and mounting lab in Woodland Park, Colorado. This blog is intended to give you a glimpse at more of the projects we're working on both here and in the field than what we're able to show in the monthly newsletter. Constructive questions and comments and suggestions are welcome. We specialize in late Cretaceous marine reptiles, fish and dinosaurs, however who knows what kind of project may pop up. 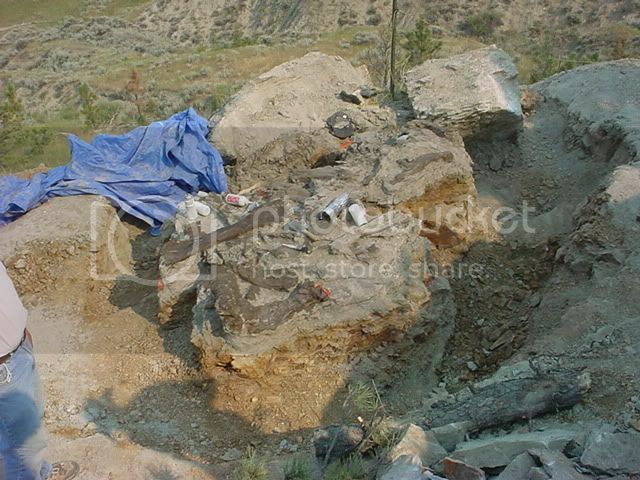 To start, here's an update on a long-running project of ours, Pete 3, RMDRC 06-005, a Daspletosaurus torosus specimen that we excavated in 2006 from the Judith River Formation in central Montana. It's in a very splintered condition, but we've developed techniques to allow us to prepare this material in order to mold it (paper in press). Currently there are 67 bones prepared, mostly ankle, pes and caudal elements. We still have an estimated 200 bones to work on. It is hard to tell for sure as we had to be very cautious in the field and expose as little as possible before jacketing. This gives us happy surprises of additional bones in the jacket. We estimate Pete to be about 11m (36 feet) long, and it should take us a good year to prepare all of the material. Scapula-coracoid is 1100mm long, mt II (in photo) is 460mm. Prep is now concentrated on a medium-sized (we'll rate it as a 2-hernia) jacket with the left ilium and a cervical vertebra, as well as another similar sized jacket with articulated mid caudal vertebrae and chevrons.